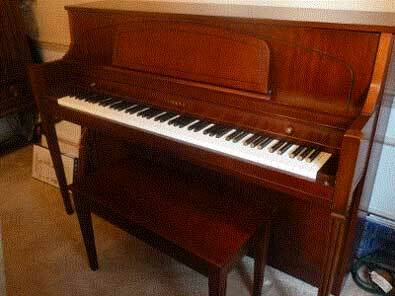 Do You Have a Yamaha Upright or Grand Piano For Sale? Yamaha Console Piano, bearing serial number T253497, manufactured in 2000. Excellent condition. Instrument looks great, is in excellent mechanical condition and needs no reconditioning. The finish is free of any wear or visible defects. The action, strings, keys, pinblock, finish, etc. are all in wonderful condition. Minimally used; tuned each year, with last tuning on December 5th, 2011. Maintained in a climate-controlled environment. $3200. 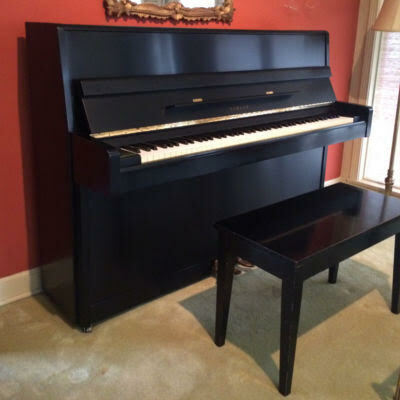 This piano was bought brand new from Memphis Music on 9/2011 with 10 year warranty. Bearing serial number H0148962, manufactured in 2010. Instrument looks great and is free of any wear or visible defects. The action, strings, keys, pinblock, finish, etc. are all in wonderful condition. Minimally used; tuned every 6 months, with last tuning on May, 2012. Maintained in a climate-controlled environment. The soundboard was cleaned one and a half years ago. 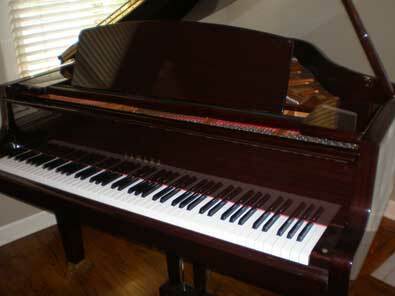 Yamaha Upright Pianos are a great choice for those looking for a good instrument. 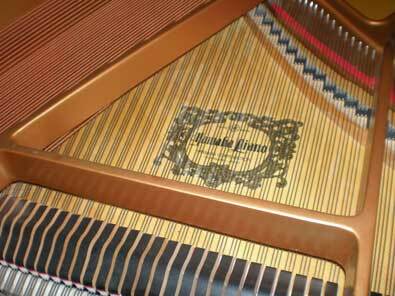 They tune up well and play as good or better than most pianos in their category. Hundreds of thousands of them have been made and sold all over the world. Yamaha imports started in the late 1950's. And it probably took at least 10 to 15 years for sales to reach a level of notability in the US. At some point dealers were selling more of these instruments than other brands. Probably up to the late 1970's new Yamaha piano prices were still competitive with many cheaper and lesser quality pianos. But that was quickly changing as new piano prices started getting higher. Tons of Yamaha's were sold in the United States throughout the 1980's and 1990's. During this time other Asian competitors such as Young Chang and Samick from Korea started exporting their instruments. But there is no doubt that the quality of Yamaha pianos, uprights and grands, stood out over the cheaper competition. Now days that is especially true when comparing pianos from China. The Chinese instruments are cheaper and not as good as Japanese pianos. The Korean pianos in the 80's and 90's were in between in quality and price. This helped them do very well in sales. 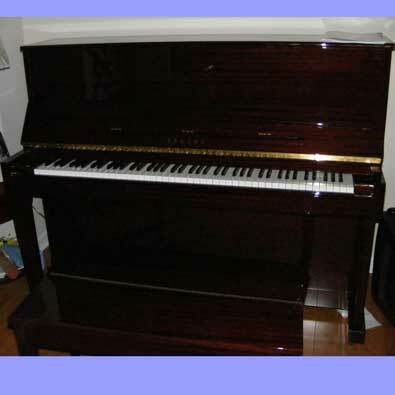 Now by 2012 the Korea pianos are no longer as good because they are being made in China. And it seems that the prices are no longer competitive. So now days the new piano market is pretty much only the top and bottom. Or the cheap and the expensive. Or should I say the good and the bad. There really is very little middle quality left. And as prices in the whole world get even higher, soon there will be no inexpensive new pianos left. This is good and bad. Good because no more cheap low quality pianos will be on the market, and no one is going to pay a high price for what is basically junk. Nobody wants to throw their money away. Bad, because only the wealthy will be able to buy a new piano. Where does that leave average income ma and pa wanting to buy their child a piano? Well it leaves them with having to purchase a used piano. And mostly used pianos being sold by individuals, not dealers. Dealers prices are usually too high. And so, ma and pa will look for individuals selling a used piano. 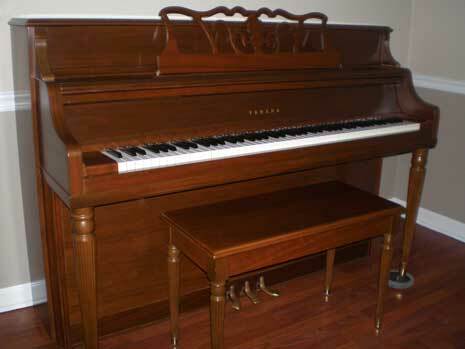 Search for a good used Yamaha upright piano in Memphis TN, Nashville and other cities. Grands too.